This was my tea. Please note that it is low-fat, low-carb, low-GI, low-EVERYTHING and yet was still tasty. And took 20 minutes to do. Also, it demonstrates something I think is important – I was only cooking for one, just for me, but it was still nice. I like to make an effort for myself, food-wise. It’s cheaper than buying shoes. What I did was: I mixed a small pot of low-fat natural yoghut with a Korma garem masala (a packet of mixed herbs and spices which I bought ready-mixed because I am lucky and live in an area with a very high Asian (Indian) population). The packet apparently contains dried coriander, cumin, onion powder, salt, bay leaves, turmeric, black cardomoms, clove, green cardomoms, almonds, garlic powder, ginger powder and star anise. If you were feeling up to it, you could make your own garem masala, but I won’t condemn you if you were to use a ready-bought paste or mix of your own choosing. Anyway. I then cut up one chicken breast into smallish pieces and slathered it in the yoghurt & spice mix. I covered and put it in the fridge. You’re supposed to let it marinade for four hours, but since I did it when I just got home, it was only an hour. It was fine. Then I threaded it onto a couple of skewers. I heated up the griddle pan with a little bit of cooking oil and just grilled the chicken skewers. Every now and then I brushed on some of the yoghurt mix and turned occasionally. They were done in about 15 minutes. In fact, they were a little overdone. Ten/twelve minutes next time. Meanwhile, I poured boiling water over a big bunch of spinch that was sitting in colander. That’s all spinach needs – to be introduced to hot water. Also, always do more spinach than you think you’ll need. It wilts like nobody’s business. 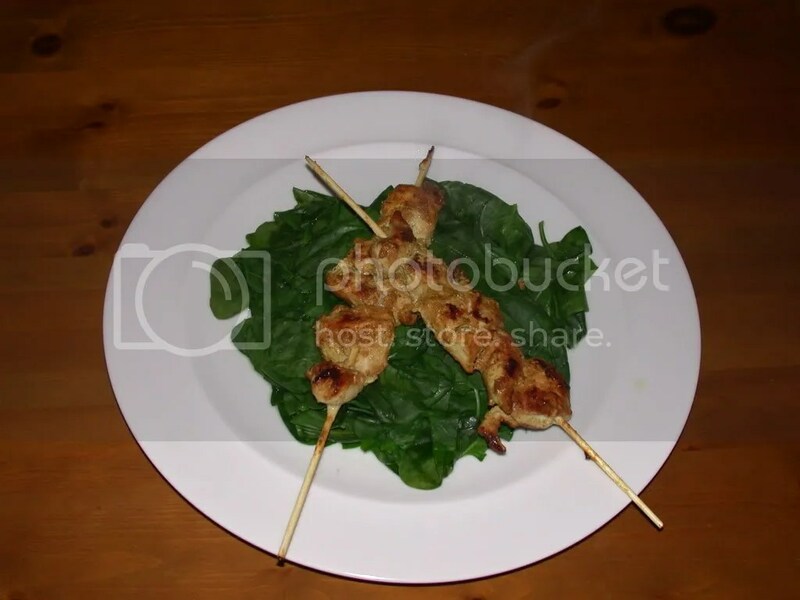 Squeeze the excess water way, dump on plate, and place skewers prettily on top. Spritz a little lemon on the spinach for an extra zing, and it helps your body absorb the iron in the spinach! I can see how that would work. I bought lots more spinach today, I’ll take your tip on board.